Aradani Druid Grove - Our Frog Pond and all its environmental benefits. Home / 2017 / April / Aradani Druid Grove – Our Frog Pond and all its environmental benefits. So I want to discuss the frog pond at Aradani. I love our frog pond here and the one I have at home. We get lots of comments every time we post about the pond, as well as some questions based on fears of standing water. So I want to talk about why we do it, and how you can too! 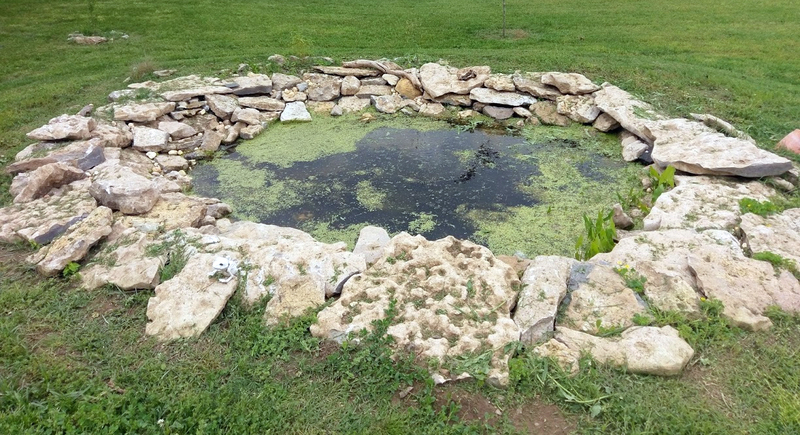 Everytime we post about our pond the first thing we hear is, “Uhg, the mosquitoes.” The truth is, a well cared for pond will not produce mosquitoes and will even create an environment that hurts mosquito population. We will discuss the benefits below and how they even hurt the mosquito population which invade from other sources! We use mosquito dunks and mosquito bits (whichever is on sale when we need them) to stop any breeding in our pond. These contain a bacteria that is harmful to mosquito larva, so mosquitos lay their eggs, and the larva mature. Instantly the pond helps control the population of one of our most hated backyard pests. 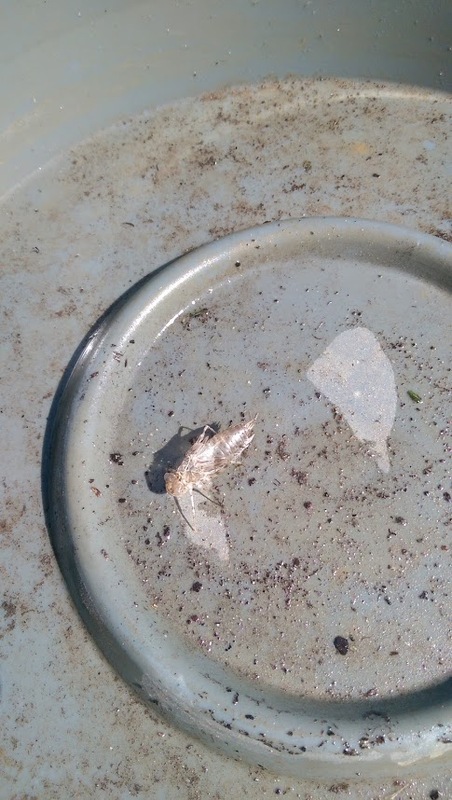 With mosquito dunks we never see any larva floating around our pond. Why do you call it a frog pond? We do not have koi or goldfish in our ponds. These fish are not native to our part of the world, so why introduce them? We know they are pretty and add to a pond, but in our view, you are taking a chance that during a flood they could be introduced to our environment. Plus they cause harm to things that do belong here. This can not only hurt the wildlife in your backyard, but also your local environment. Gold fish and koi basically eat and poop. This means anything that goes near your pond probably ends up as a meal. We had bull frogs in our home pond for a year, but they are naturally part of the environment, and though my tree frogs visitors dropped drastically, it is part of our natural state. Koi and goldfish eating tad poles, small frogs, dragonflies, and dragonfly larva actually cause more mosquitos because the invasive fish that are in the pond are killing the natural predators of mosquitoes. So by making it a “frog” pond, what we are doing is setting up a native feature for native flora and fauna. So how does a frog pond help? First, having a frog pond helps an animal that is declining as we take over its habitat. The good news, even a small pond (mine at home is only 3’x3′ and 3′ deep in one spot) can help support a pretty large population of frogs. By having more frogs, you have natural predators of nuisance bugs. Sadly, it seems that frogs don’t really eat mosquitos. But they are amazing at helping with other bugs that may attack your garden or decorative plants. Frogs (and toads) can eat caterpillars, slugs, cutworms, and others. But your frog pond will attract a mosquito killer. The dragonfly. An adult dragonfly can eat 30 to hundreds of mosquitoes per day. So these flying assassins are grabbing all the mosquitos attracted to your pond, making your backyard better. And dragonfly larva, who live in ponds, eat mosquito larva. Now due to our dunk, there are no mosquito larva in our pond, but those dragonflies are also laying eggs in places nearby where there are mosquito larva. So it’s a win/win. Dragonfly casing from our pond. The pond at Aradani, which was only filled for half the year last year, had casings from dozens of dragonflies by the end of summer. Meaning our little pond was a great launching pad for these mosquito killing daredevils. Another benefit of having a natural frog pond; no chemicals. Koi and goldfish poop a lot. So you have to keep using chemicals to keep the water clear and the fish healthy. In my home pond, all we have is a simple waterfall (UV helps burn off any unwanted chemicals or bacteria) and every test every year has shown that the water is healthy. It is a little smelly if I have to dig around in the soil layer, but that’s what a pond or lake is supposed to smell like. At work, we use a small solar powered pump to start a tiny waterfall, but we may be upgrading it later on. I keep just a few local plants in my pond, water lilies, underwater oxygenators, and some arrowhead shore plants. It adds some interest to the pond, and it helps keep the water clean. And the best part is that ponds are pretty and they give you a nice, peaceful place to relax next to and have a cup of your favorite beverage. So there you go. That’s why we have a frog pond at the Aradani office, and how it contributes to our Druid Grove. Next article: How to build a frog pond.